As at 2018 the area is under consideration for inclusion in the St Paul's Conservation Area. 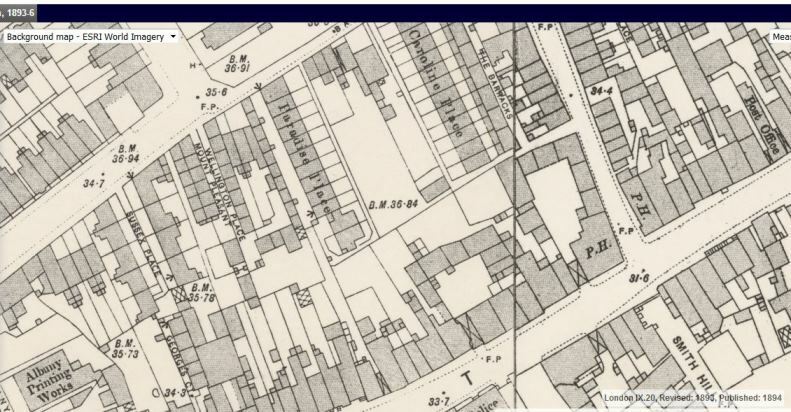 The OS map revised 1893 and published in 1894 shows the locations of three of these roads, bounded by High Street to the south, Albany Road to the north and Ealing Road to the east. Sussex Place looks a cut above a normal terrace, with wider frontages and small gardens to front and rear. Paradise and Caroline Place properties were a little smaller and those on Paradise Place opened on to a path or alley whereas the Caroline Place properties had small front and back gardens. But where was Catherine Row? At the time we concluded it may have been a later build, perhaps off Catherine Place. The image below is from an OS map freely accessible on the National Library of Scotland website; it is at a scale of 1:1056, find out more. 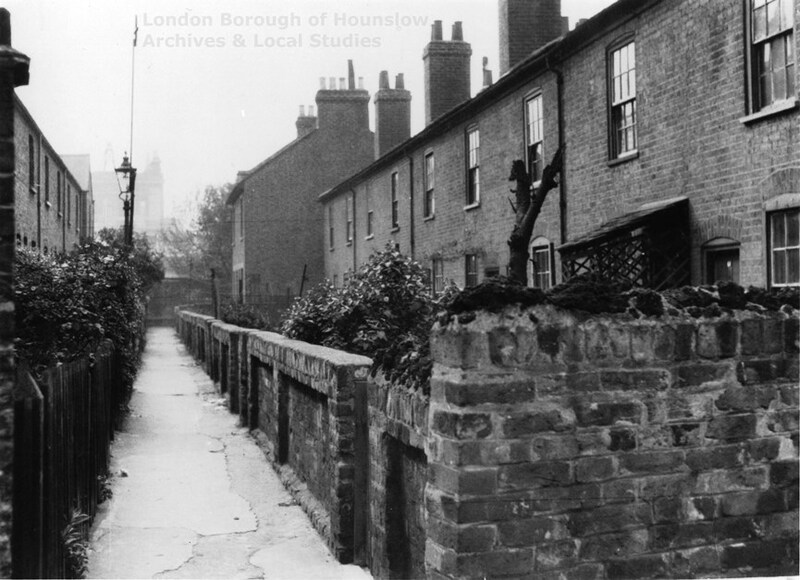 As to the dates when these properties were built, Caroline Place and Wellington Place are mentioned in the will of George Sanders of Old Brentford written in 1850 (13 and 8 copyhold properties respectively); so by 1959 the Caroline Place properties were over 100 years old and deemed unfit for habitation. 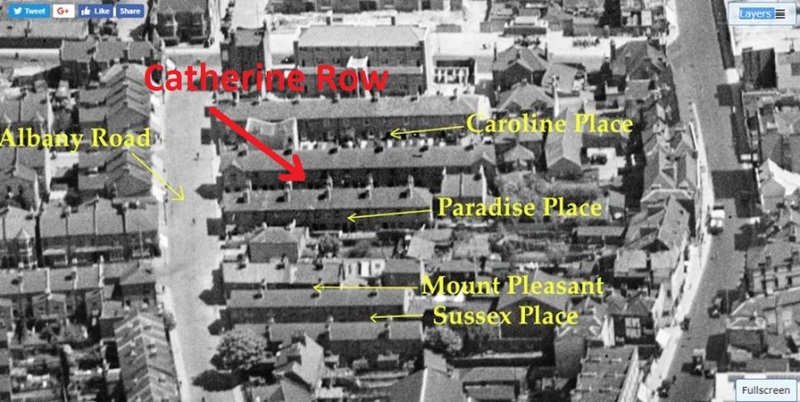 Catherine Row must have been only 60 or so years old when it was demolished. VP's identification of the aerial view and using theBrentford Past photo, combined with a joint effort in matching to the OS map, means what were simply road names can now be seen: small, two-storey homes, part of our shared heritage and story. West London Observer 11 July 1863 Old Spring Gardens, Brentford, Middlesex. Valuers, &c., &c., Brentford, W.
The sale took place a couple of years after the 1861 census and the address 'Paradise Place' has not been indexed on Findmypast. However Stephen Barkshire, 34, labourer, living nearby at 5 Sussex Place with his wife Elizabeth 29 and daughter Mary Jane 8, both born in Old Brentford seems a reasonable fit to the tenant named in 1863. The property was occupied by four households, a total of 13 people; occupations including fruit hawker, basket maker and garden labourer. Previous pages in the census covered Wellington Place, Mount Pleasant and then Paradise Place. John Taylor, 55, bricklayer, born Enfield, wife Sophia and four children aged 8 to 15 were living at no.3 Paradise Place and he could be the tenant referred to in the advert. Further checks on Findmypast show Paradise Place has been indexed as a house name, with the address Back Lane. The following two properties, Cliff Cottages, were occupied by Lamb and Hayes. These may be the two larger properties adjoining the end of Paradise Place.